Tasty though rice is, you cannot have too much of it, because of the cal-scare it gives weight-watchers and diabetics! 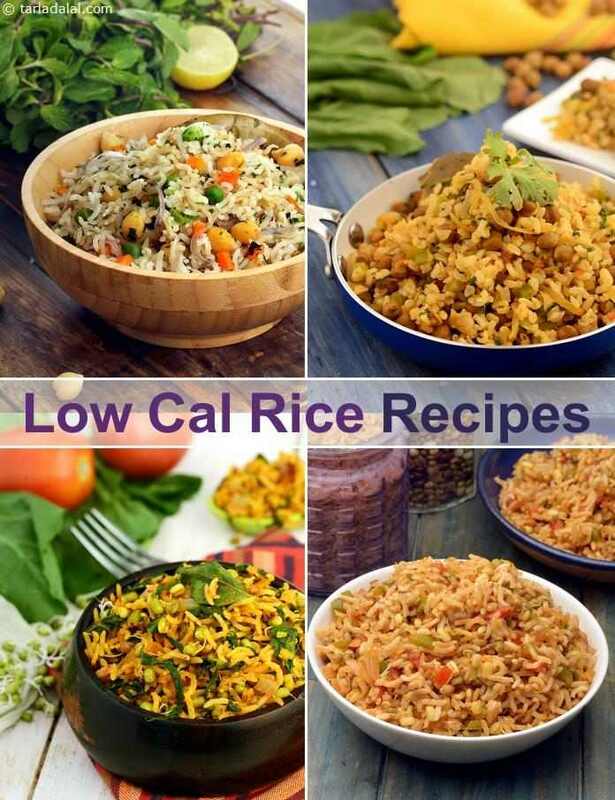 The Low-cal Rice Recipes in this section make use of substitutes like brown rice, bulgur wheat, etc., to make mouth-watering but healthy rice delicacies like Fenugreek and Mushroom Brown Rice , Bulgur Wheat and Matki Pulao , etc. Iron-laden methi greens are combined with vitamin c rich tomatoes which helps in the absorption of iron. For an additional fibre touch, i have used the unpolished brown rice which is beneficial for weight watchers, diabetics and people with high cholesterol. The low-calorie soya delicacy is a favourite with nutritionists. Its high protein and heart- protective compounds make a healthy addition to the regular pulao. Spinach pooled with kidney beans and rice delicately flavoured with cumin seeds powder. One serving will give you a nourishing supply of protein, folic acid and iron. The protein contained in rice and dal complement each other to give a higher quality protein which is the corner stone of our nutritious meal. Be sure not to rinse the rice more than required to remove the dirt since excess washing will result in loss of vitamins.